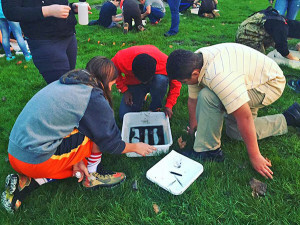 Tag Archive | "water conservation"
Trout Unlimited’s Rogue River Home Rivers Initiative has worked with over 1,500 local students just this past year and they are not slowing down when it comes to engaging our youth in science and water conservation. Throughout this month, Trout Unlimited got the opportunity to work with 250 new students from Cedar Springs High School to monitor the health of Cedar Creek in downtown Cedar Springs. 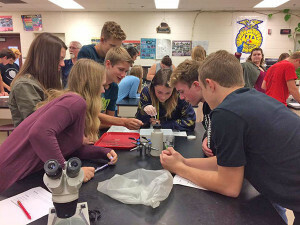 High school teachers Steve Vree, Eddie Johns, and Larry Reyburn reached out to Trout Unlimited to continue their successful partnership because they appreciate the importance of getting students out of the classroom and into their community. Thanks to their support, students from 8 science classes have designed experiments studying the effects of stormwater pollution, trees, and, excess sedimentation on the cold water trout stream using the Leaf Pack Network experiments. They created artificial leaf packs and placed them somewhere in the creek depending on their experimental conditions. The students waited for the leaf packs to stay in the stream for four weeks so that they could be colonized by macroinvertebrates. Students worked in the lab to identify the macroinvertebrates that they use as indicators of water quality. The data, which varied from scores of excellent to fair, will be uploaded to the Leaf Pack Network where schools from all over the country have entered local stream conditions. To date, the Home Rivers Initiative has worked with over 800 students on the Leaf Pack Experiment. The experiment is a great way to give students hands-on, real world research experience while raising awareness of the importance of streamside forests to the ecology of rivers and streams and to promote their stewardship.